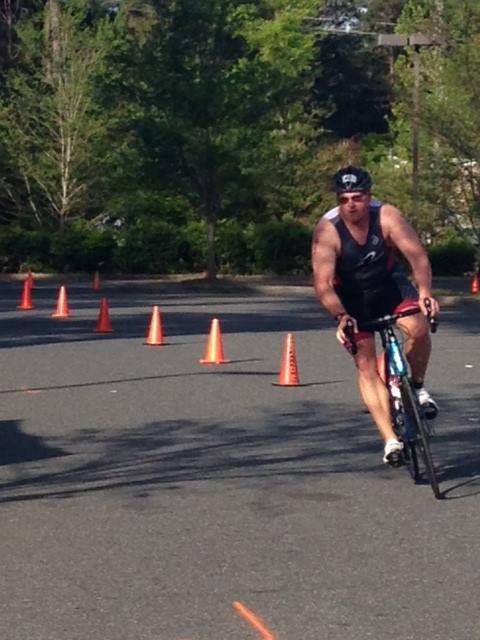 The Huntersville Sprint Triathlon was this past Sunday, April 27th and one of our trainers, Alex Reynolds, was participating. The 2013 Huntersville Sprint Tri was his first and he encountered a few issues; slow transitions and a crash on the bike course. I remember Alex saying how much fun he had and he seemed to have caught the “Tri Bug”. For those of you who don’t know Alex, he is a big guy. A former strong man competitor and all around big guy. He is definitely one of those guys you want on your side when a brawl goes down. He raced in the Clydesdale division and finished around 27 minutes behind the winner of his division. Even with the crash, I remember him saying that he had fun. Let me take a step back. Alex and I rode our bikes home from Precision once last summer. He had his commuter bike with him and when he got rolling, I had a hard time staying with him due to his massive legs pushing the pedals with ease. I am sure it was quite a sight as little old me trying to hang onto Alex’s wheel that day. I am probably a little more than half the size of Alex and I was flying trying to keep up with him. The only time I got him was on the hills. I was able to pull away from him. Once Precision moved into our new place and we had the performance lab with the Computrainers up and running Alex’s training kicked up a notch. He was really pushing himself…hard! He was swimming a few days a week and running the trails as well. He has been riding Brushy Mountain just about every weekend in preparation for the Beech Mountain Metric, which is in a few weeks. The results speak for themselves. For Alex to get these amazing results, he had a training plan that he stayed with and I am sure he made some adjustments along the way, but overall he didn’t decide to train hard instead of taking a planned rest/recovery day. He planned his work and worked his plan. So, next time you see Alex, congratulate him on his accomplishment. I can’t wait to hear how the Beech Mountain Metric goes for him….